Since it’s busy back to school season, I’m sharing some convenient & fun drink ideas for those school lunches as part of a sponsored campaign for Collective Bias®. It’s no secret that I’m a big fan of creative lunch ideas. Big Brother loved his first day of school Star Wars themed lunch! And, we just did a little dinosaur fun themed lunch on Friday as well! Aren’t those fun? Big Brother loved them! But how about adding a little fun to lunch with the drinks too?! I’ve got three convenient solutions for you, which are all part of the Nestle Brands Lunch Solutions and can all be picked up in a quick trip to the store (you can see my full shopping trip here). While we were stocking up on some school lunch foods, I picked up Nestle Pure Life Water Bottles, Nestle Pure Life Water Juniors, and some Juicy Juice 100% Juice Drinks. They still have the fun Monsters University Juicy Juice boxes available, so Big Brother was SUPER excited to get some of those! I think we’ll have to do a fun Monsters U themed lunch one of these days, as the juice boxes are super fun on their own. Can’t get easier than that! But, while the juice is fun, I try to limit juice intake a bit, so I was really excited to try out some fun water bottle options! 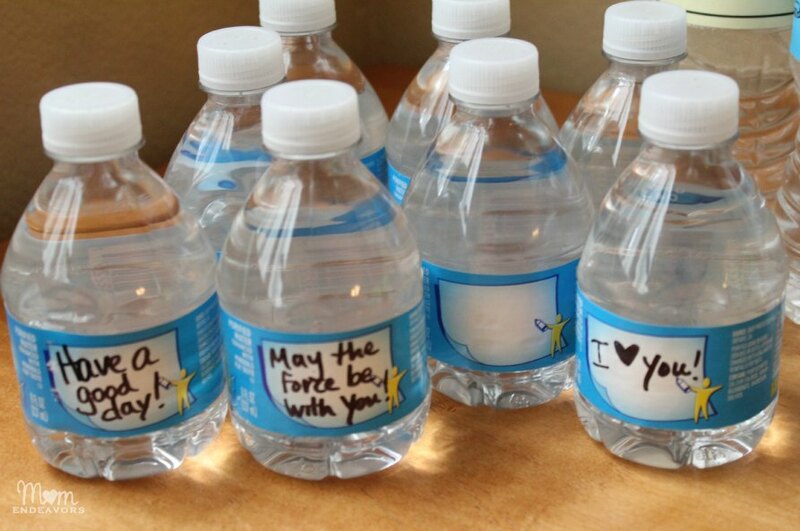 I love these little Nestle Pure Life Water Juniors! Not only are they a great size for little hands during lunch, but there is a blank portion on the labels! You can write in your child’s name or little fun notes. You never know how much a little special note might brighten up their day and doing it this way makes things really easy! So, I think that’s great. But, I wanted to take things a step farther in the creativity department! So, I made some school themed printable labels and then wrapped them around some of our Nestle Pure Life Water Bottles! I LOVE how these turned! An easy and fun way to make lunch a little more fun for sure! And, I’m sharing them with you! 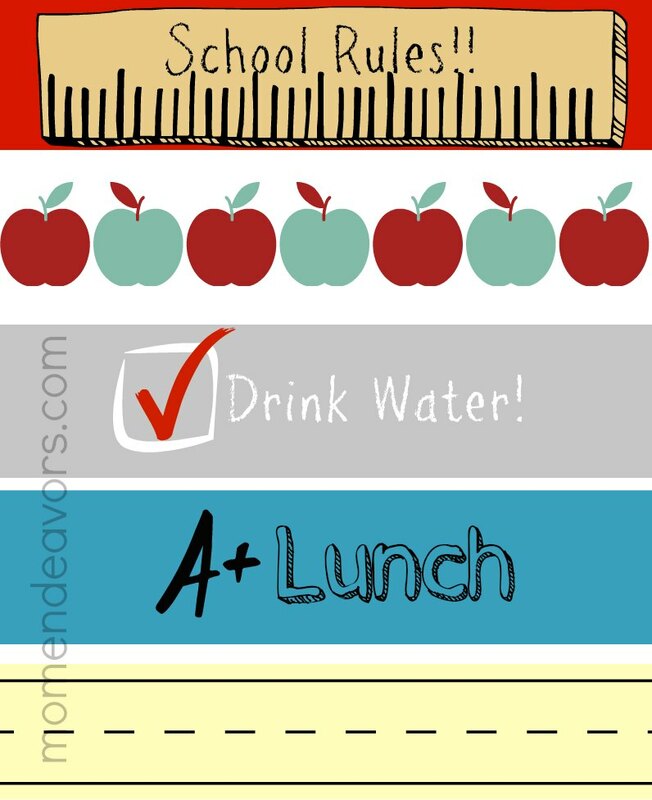 You can download the School Lunch Water Bottle Labels below and print out your own. For reusable fun, you can laminate them to use throughout the school year. So, feel free to click on the image below to down­load your own printable copy! (Just for per­sonal use only!). The downloaded file will not have a watermark. Please com­ment or email if you run into any issues with down­load­ing or the file isn’t print­ing well! 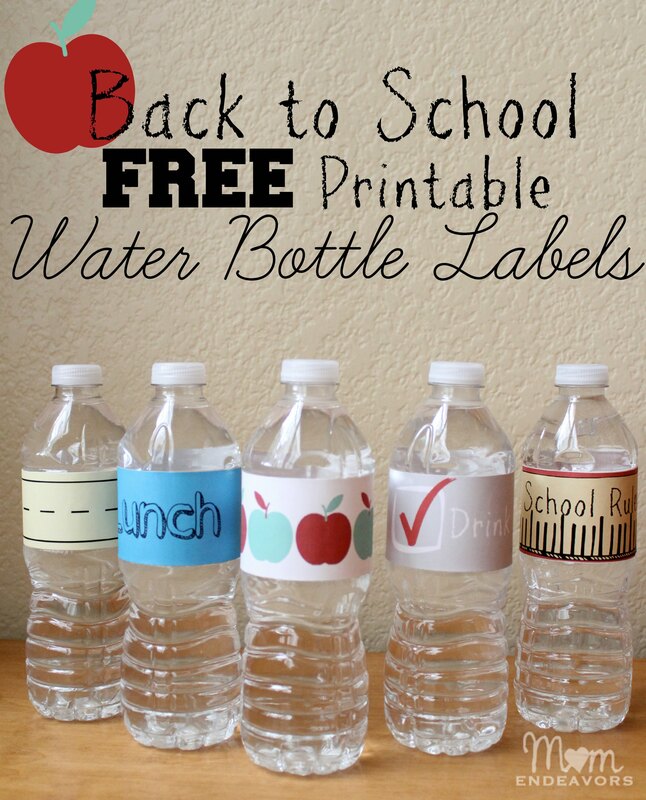 FREE Print­able Back to School Water Bottle Labels Once you print out the sheet, just cut the labels to fit your bottle and tape them on. They fit on the Nestle Pure Life bottles great! I left the last one black so you could write in your own messages! 🙂 So there you go! 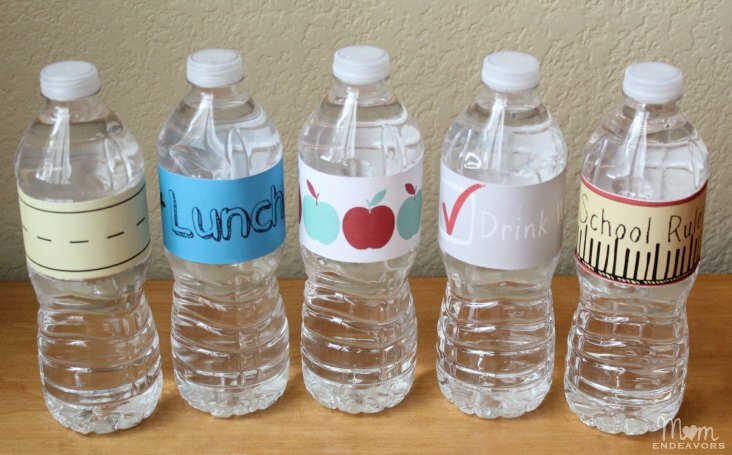 Some Nestle Lunch Bunch Solutions for 3 convenient drink ideas to help make school lunches more fun! How do YOU like to make lunch more fun? Be sure to follow along on Twitter with the hashtag #BTSIdeas and on Facebook! 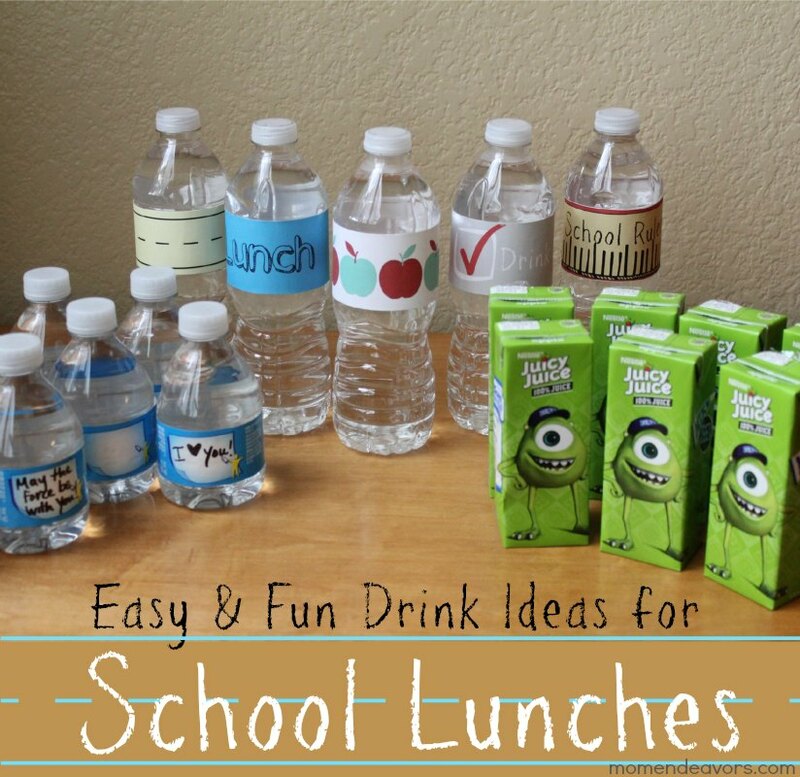 And, stay tuned for more fun lunch & back to school ideas here on Mom Endeavors! I LOVE your labels! My boys love ALL things Star Wars..they would love it! What fun! 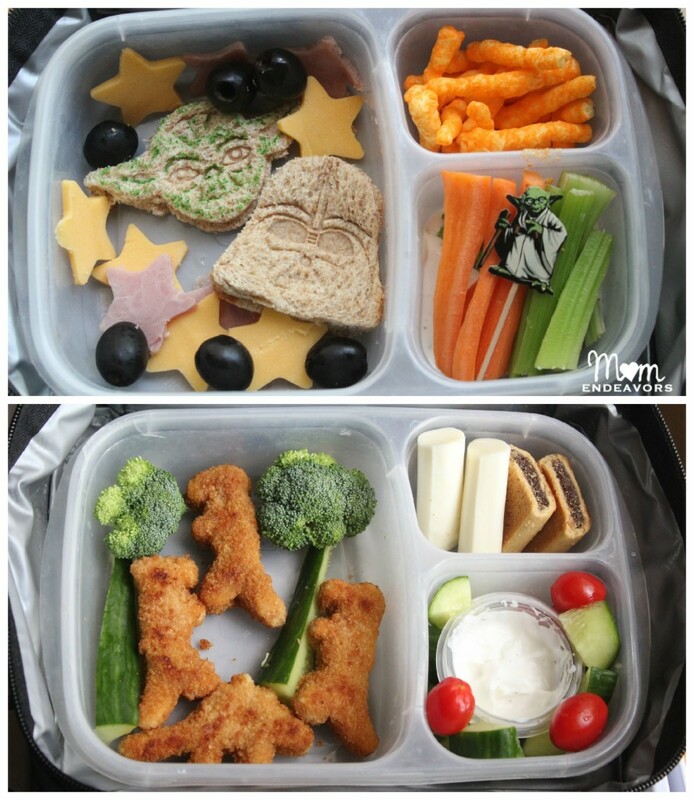 I’m getting so inspired by seeing all your clever ideas–totally dig the Star Wars lunch, way too fun! A Monsters U one would be great too! And I love the write on labels and the ones you created–they’re way too fun!